The glycogen stores in your liver and muscles depend on your carbohydrate intake. Your body converts glycogen to glucose (a type of sugar), which your muscles use as a primary source of fuel during exercise. This means that your ability to exercise is limited by the amount of glucose in your body. After about 90 minutes of exercise, your body’s supply of glycogen is completely depleted, which puts you at a risk for “hitting the wall”, or feeling lethargic during your endurance event. If your body doesn’t have enough glycogen to sustain you, it will start to burn fat for energy. Fat burns at a much slower rate than carbohydrates, which will slow you down. All the more reason to eat some carbs before working out! InsideTracker can help you find the sources of healthy carbohydrates to meet your fitness and nutrition goals. Click here to learn how InsideTracker can use the results of your blood analysis to recommend the perfect pre-workout foods! Like carbohydrates, fats are an important source of fuel for the body (they contain 9 calories per gram, compared with 4 calories per gram in carbohydrates and protein). While calories from fat aren’t as accessible as carbohydrates to athletes performing quick, intense efforts like sprinting, they play an important role in lower intensity and endurance exercise such as light bicycling or jogging. Many people don’t like to eat before working out—especially if they exercise early in the morning—because they’re afraid of cramping. While it’s true that exercising on a full stomach can cause some people to experience nausea, muscle cramps, or lethargy, not eating beforehand may make you feel light-headed, weak, or sluggish because your body doesn’t have enough fuel to sustain you during exercise. If your workout is more intense than a brisk walk or a light jog, you might want to opt for easy-to-digest carbs like a banana, toast, or oatmeal to provide keep you energized. If you’re the type of person who is typically hungry in the morning when you wake up, be sure to grab a small snack before an AM workout. You need to allow time for the foods you eat before your workout to be digested and absorbed. Plan your meals and snacks so that the energy that they provide is readily available when you exercise. The time your body needs to digest depends on the type and quantity of the food that you consume. Generally, foods that are high in protein, fat, and fiber take the longest to digest, and the same is true with large meals. While you shouldn’t be famished when you exercise, it’s equally important to leave enough time before your workout to allow your body to digest. In general, larger meals take 3-4 hours to digest, smaller meals can take up to 3 hours, and small snacks can take as little as 30 minutes. However, every body is different, so try experimenting with your eating and exercise schedule to find out what works best for you. What are some good pre-workout meals? If you’re planning a meal a few hours before you exercise, try eating a combination of carbohydrates, protein, and fat. Lean hamburger on a bun and some mixed yogurt and fruit – red meat is an excellent source of iron and protein, and serves as a perfect compliment to the vitamins and minerals that are found in the fruit. Hummus sandwich on pita bread with carrots – this protein-and-carb combination will help keep you satisfied during a long workout. Sweet potatoes and kidney beans – sweet potatoes are high in carbs, fiber, and vitamin A, while kidney beans will provide you with the protein that you need for muscle recovery. 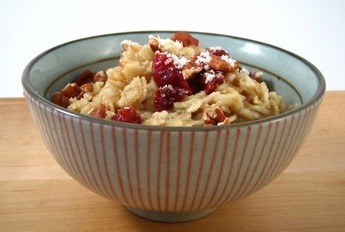 Oatmeal with brown sugar, almonds, skim milk, and a banana - oatmeal is a great choice for long runs because it helps keep you satisfied without weighing you down Peanut butter & honey on toast – this snack is popular among vegetarian athletes because peanut butter is an excellent source of protein. As your workout time draws closer, opt for a meal that is heavier on carbohydrates with a little bit of protein to help you feel satisfied and energized. Low-fiber cereal with skim milk – while fiber is a healthy part of any diet, it often causes many people to feel queasy right before a workout. Since muscles can convert simple carbs into energy faster than fiber-rich foods, try low-fiber cereal if you’re eating right before exercise. Low-fat yogurt with banana – bananas are an excellent source of both potassium and carbohydrates, while the yogurt provides your body with the sugar and protein that it needs to stay energized. Hard-boiled eggs – not only are eggs a great source of protein, but this low-calorie snack is also a great choice for people who are watching their weight. A balanced pre-workout meal will help sustain you through your exercise, and InsideTracker can help you learn how!